Simply like to post some interesting result for my readers. Below you can see my profit which I’ve got from using the free bonus of PrivateFX broker. In the beginning of August I’ve wrote the article about $100 investment bonus from Privatefx. 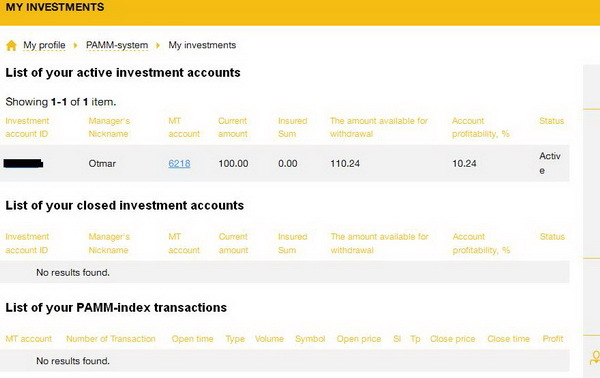 So, I’ve got this money and invested them to pamm account of trader Otmar. 8 days have passed. Some minutes ago I’ve made screenshot. As you see, my profit is $10.24 for this days. What about you? Did anybody try to get and invest this bonus? Did you receive something interesting from such pamm investment? I wait for your answers and screenshots at comments. Write a comment to "Privatefx pamm investment results"